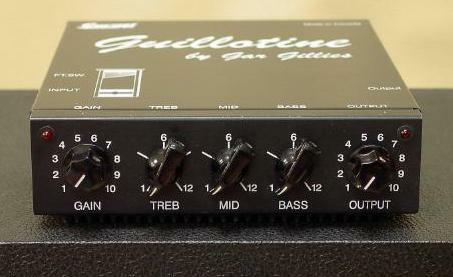 Guitar Pre-amp and Distortion Effect! These units are assembled by hand - delivery times vary. 12 volt power supply included. $425.00 CAD - includes shipping to Canadian Addresses. Click the button below to buy a Guillotine now with Visa, Mastercard, or your PayPal account. $440.00 US - includes shipping to US Addresses. For quotes to other international addresses please email.